It is a wonder of nature and human skill that attracts more than three million visitors each year. Recognised by UNESCO as a world heritage site, with 61 of its buildings protected as historic monuments, it is among the most famous touristic places of France and the entire Europe. Through history, this island inspired artists such as Henry Adams and Claude Debussy, and even became a part of contemporary culture when it was used as an inspiration for the design of Minas Tirith in Lord of the Rings’ Return of the King. 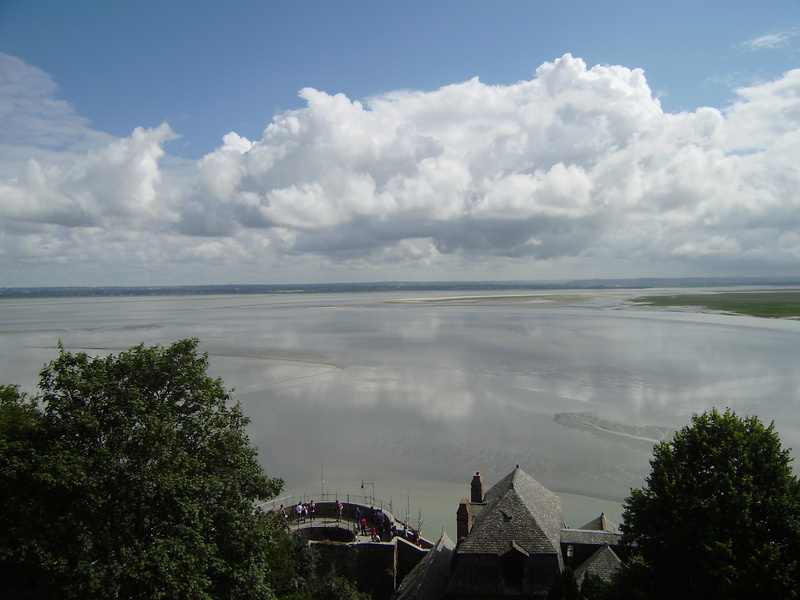 Mont Saint Michel is a rocky tidal island in Lower Normandy, situated in a very specific location only 600 meters away from land, at the mouth of the river Couesnon. 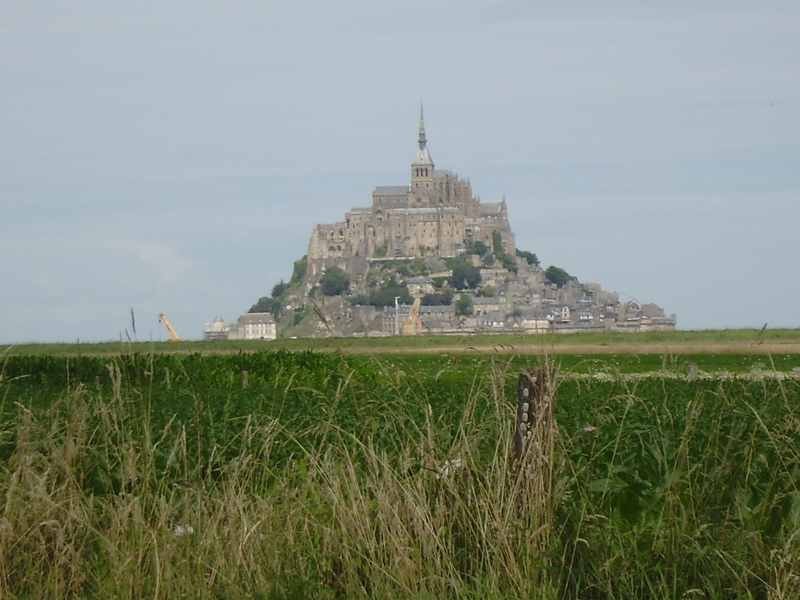 Before the formation of the first monastic establishment in the 8th century, the island was called Mont Tombe. 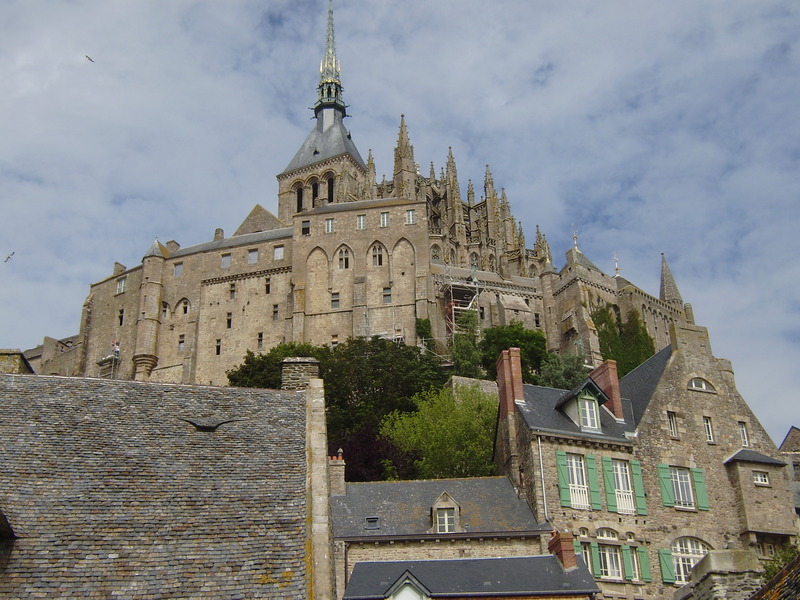 According to a legend, Archangel Michael appeared in a vision to St Aubert, the bishop of Avranches, in 708, and ordered him to build a church on the island. The bishop disobeyed, which made the Archangel burn a hole in the bishop’s skull with his finger, as a sign of warning. 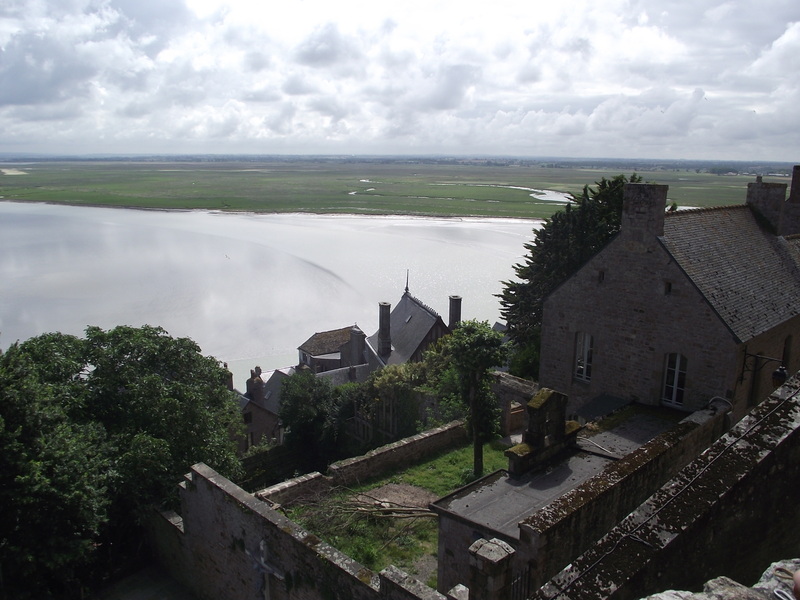 This legend bonded the island irreversibly to its religious and spiritual heritage: its medieval history was marked by the pilgrims who visited the island and its abbey. Situation changed during the time of Reformation, when the island’s popularity as a centre of pilgrimage waned, while at the French Revolution there were hardly any monks left at the island. The abbey was closed and turned into a prison until 1863 when it was closed thanks to a campaign launched by the influential figures of the time who wanted to restore the medieval architectural treasure. Approaching the island feels, true to tradition of the place, like a real pilgrimage, with visitors coming from all parts of the world and uniting in a single line on the road that leads to the entrance of the medieval town. Although there were so much history standing between us and the medieval pilgrims, the feeling of seeing the Mont for the first time must have been the same: staring in awe at the island with glimmering golden rooftops, seagulls skimming above the town surrounded by the fantastic natural area where the sky, the land and the sea all come together, disguising where one ends and the other one begins. Within all the majesty and beauty, however, there was also a sense of subtle danger, emphasized by gloomy signs warning us about the areas where it is forbidden to move around. 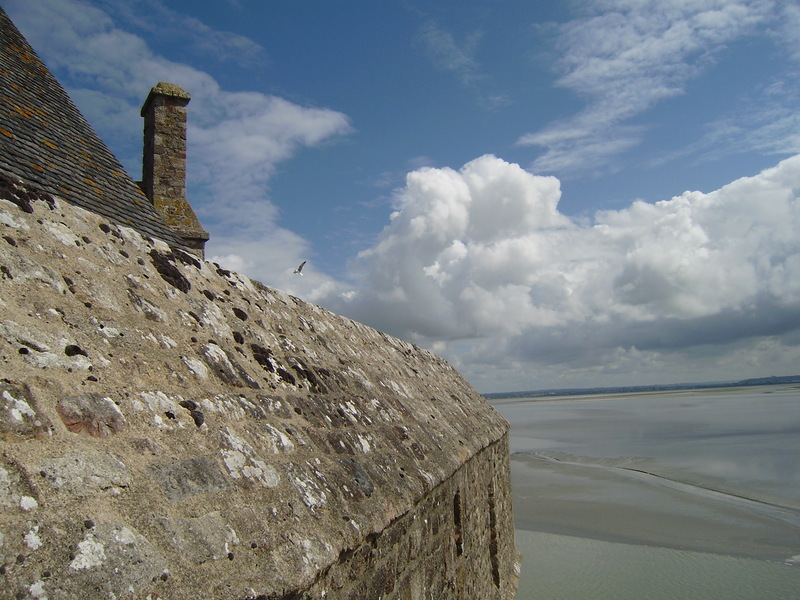 They alerted us about another one of unique characteristic of Mont Saint Michel: strong tides that once served as a natural defence system of the island, and that today represent a natural wonder that people come to witness. 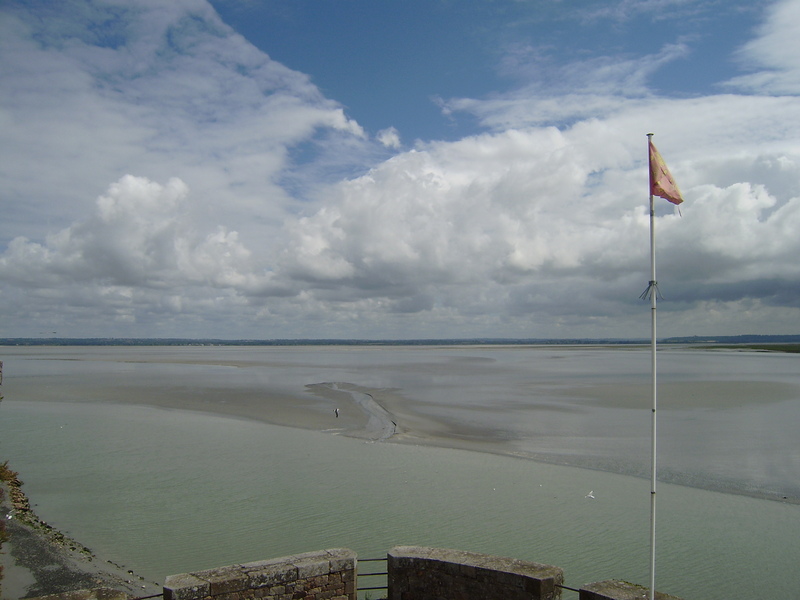 In the area surrounding the Mont, tides can vary greatly, and the span between low and high water marks can climb up to 14 meters. 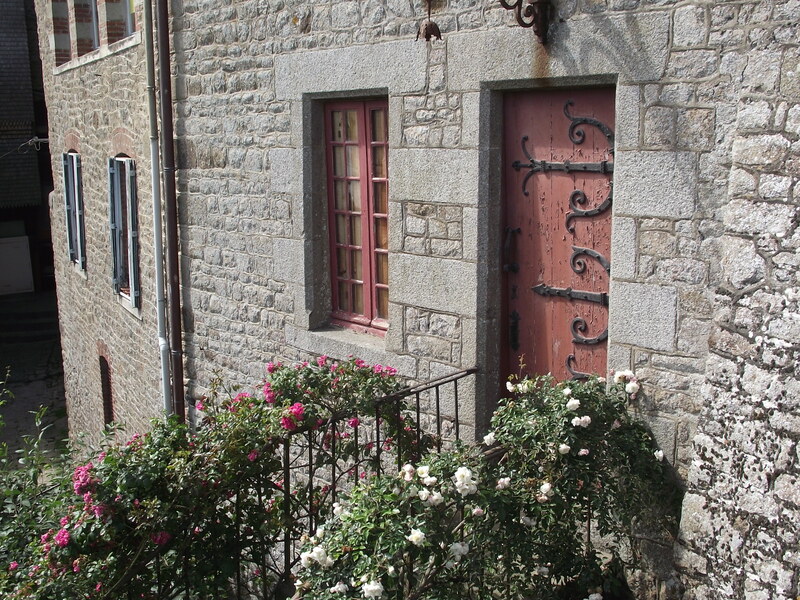 Because of this, medieval pilgrims popularly nicknamed the island „Saint Michel in peril of the sea“, and the feeling of subtle anxiety was present almost every step of our way to the Mont. As if one wrong move could get us stuck in quicksand or drowned by a tidal wave that we knew was inevitably coming. 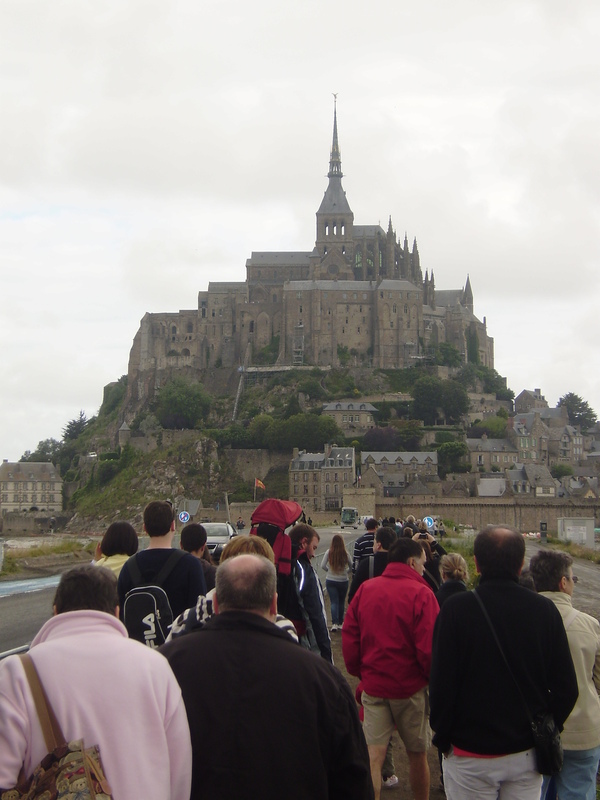 The walk towards Mont Saint Michel reminded us of the great power and unpredictability of Nature. At every step of our journey, something changed, and among all that stood a landmark built of sand and stone, brave and undefeated for so many centuries. 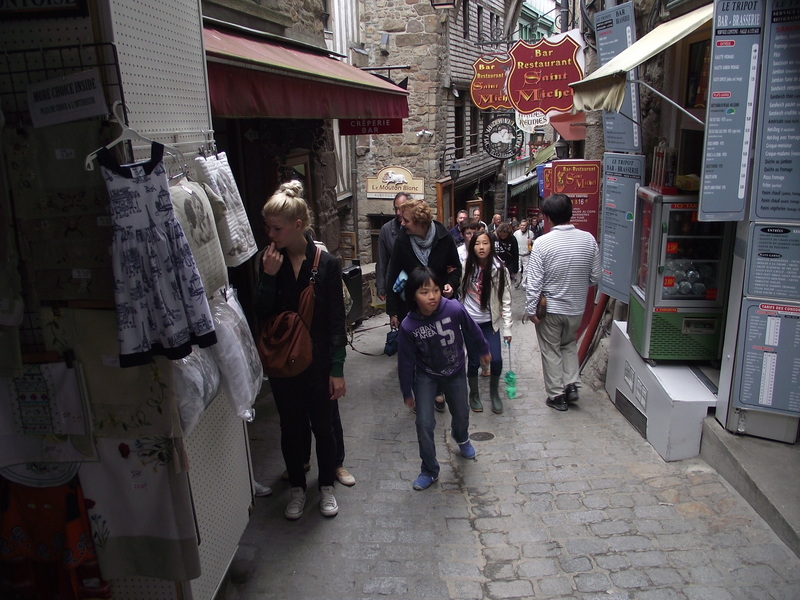 Inside the town, authentic old stone architecture mixes with modern shops selling souvenirs and postcards depicting the mount from all perspectives imaginable. The town is surprisingly small, definitely too small for the number of tourists that flock it every day. Climbing up its narrow steep streets on occasions turned into real torture while we were trying to dodge tourists posing for photos in the middle of the street or buying souvenirs. However, despite of the crowds that made us think about the horrors of mass tourism for the millionth time, Mont Saint Michel still offered us hidden corners, blind alleys and portals that made us feel like time travellers – seeing them, the signs of today disappeared and we were able to freely enjoy the history, culture and art at their finest. 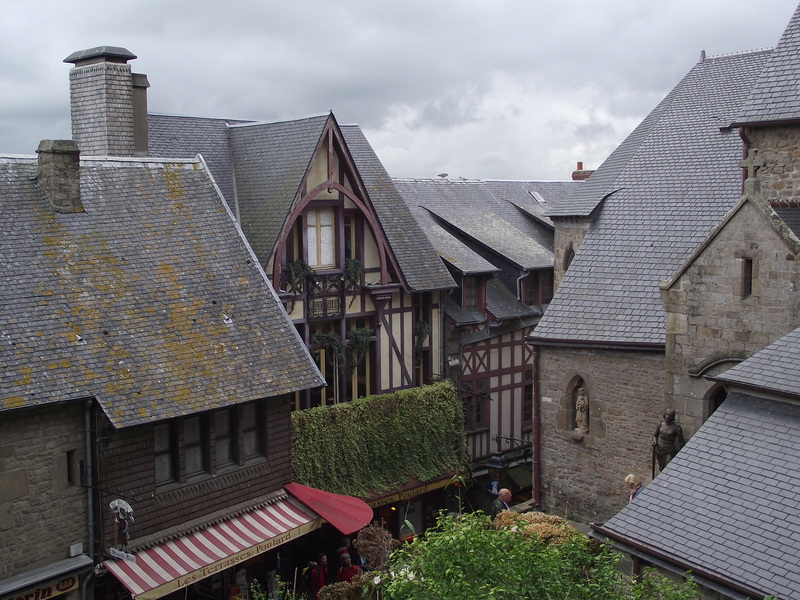 Mont Saint Michel was built in a way that symbolically represents the structure of feudal society of the time: at the lowest level, housing and stores, higher up Great halls and on the very top – God, symbolised by the abbey and the monastery. Such structure serves as a constant reminder of the spiritual fulfilment and purpose of the island. And like so often in life, the climb to the „higher“ instances – to perfection – was not that easy. 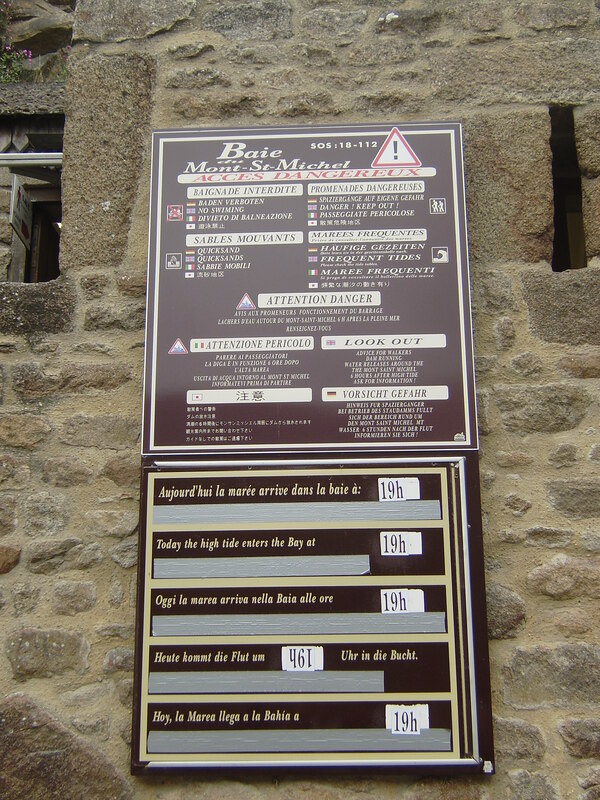 But once we got at the top of the Mont, we were profusely awarded for our effort. 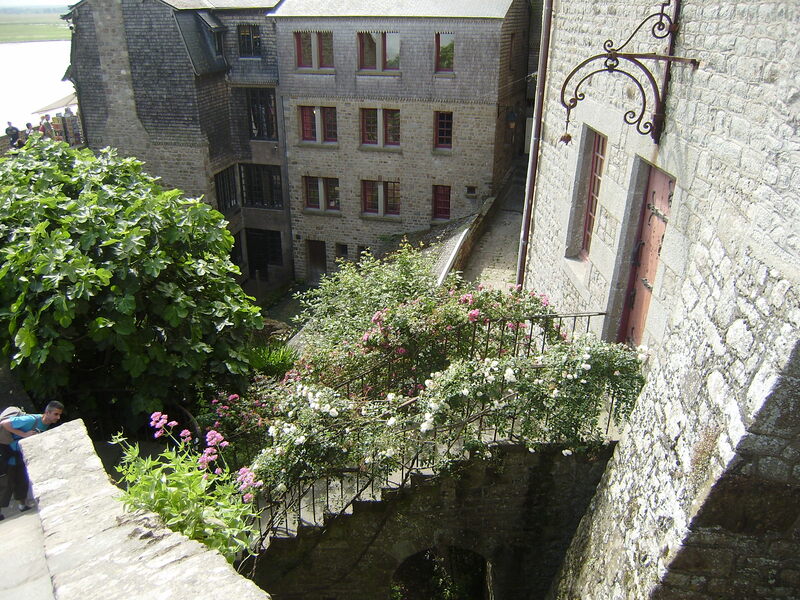 Wherever we looked – at the abbey, down the town, at the architecture or the bay around the island – we saw simple, peaceful and absolute beauty. 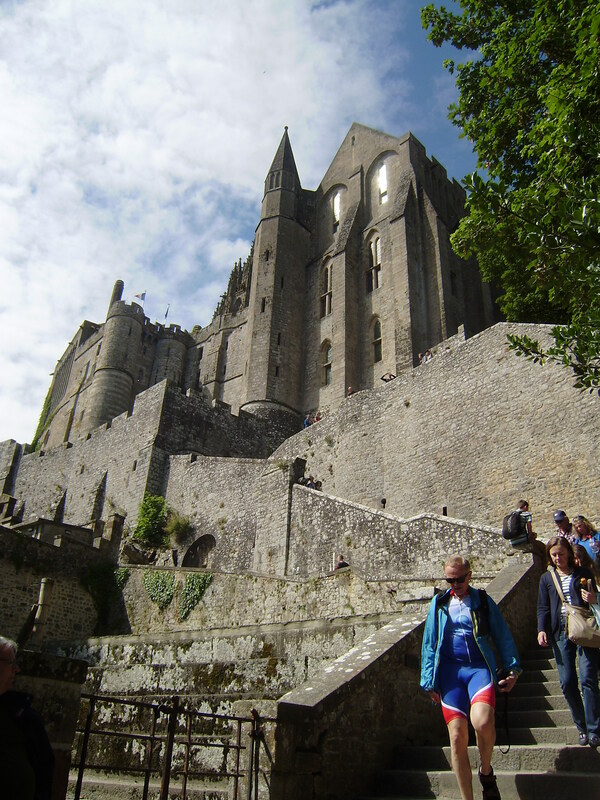 The architectural complex that gives the island its spectacular majesty is the Mont Saint Michel Abbey. The architect chosen to build the church was William de Volpiano in the 11th century. He built a Romanesque church with the transept crossing situated at the very top of the island. The role of the abbey was especially important during the 12th century, when Benedict monks in the abbey translated Aristotle’s works from Greek to Latin and thus left their important mark on the intellectual development in Europe. The abbey’s main façade was built by Robert de Thorigny in the 12th century, and subsequent building projects gave it its gothic elements. The final influence on the appearance of the building was made in the 19th century, during the period of restorations by Viollet-le-Duc’s pupils. At that time, in 1895, the sculpture of Archangel Michael was added to the top of a neo-gothic spire by the sculptor Emmanuel Frémiet. 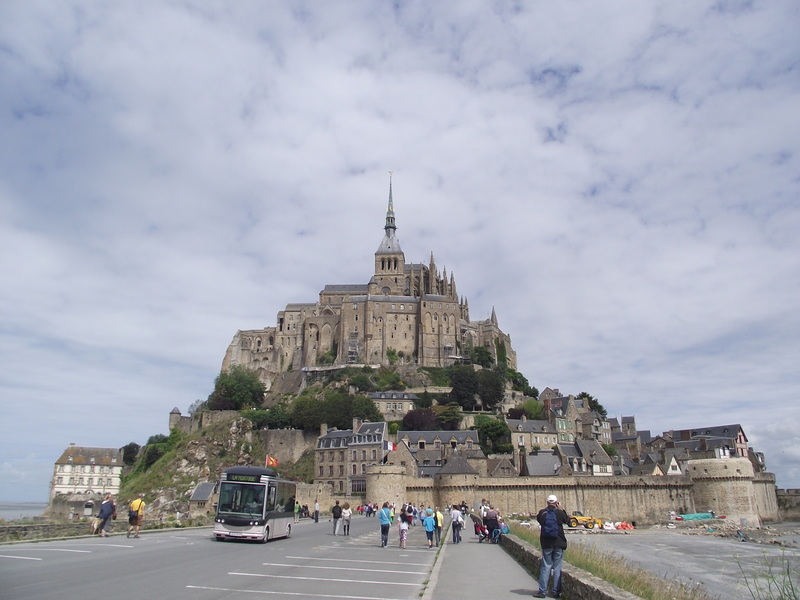 One of the more surreal ways to experience Mont-Saint-Michel was the one we had returning from our visit. 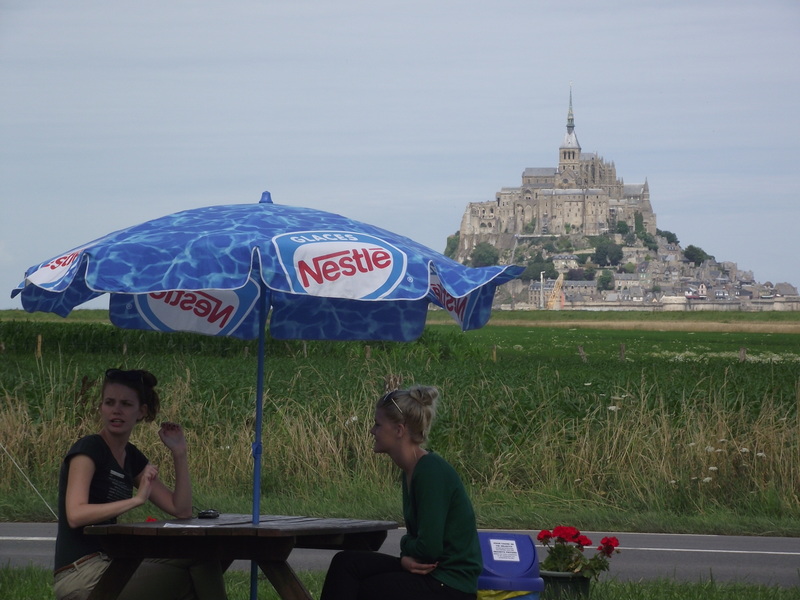 As we drove away and kept looking behind us to catch „just a bit more“ of the Mont, we stumbled across a fast food truck by the road selling absolutely un-French dishes. However, since it was as good time as any to stop and have something to eat, that is what we did. And the complimentary view stretching before us was… amazing. Behind the green and yellow fields, in the distance, stood the majestic Mont Saint Michel, posing proudly for one final photo, giving us the chance to take one more good look and etch it in our memories. It really was an absurd, special experience – a million dollar view of a majestic sight from a resting area by the road, which we enjoyed while munching on fries and hot dogs. I guess such things can only happen in France. And it was an experience to remember. 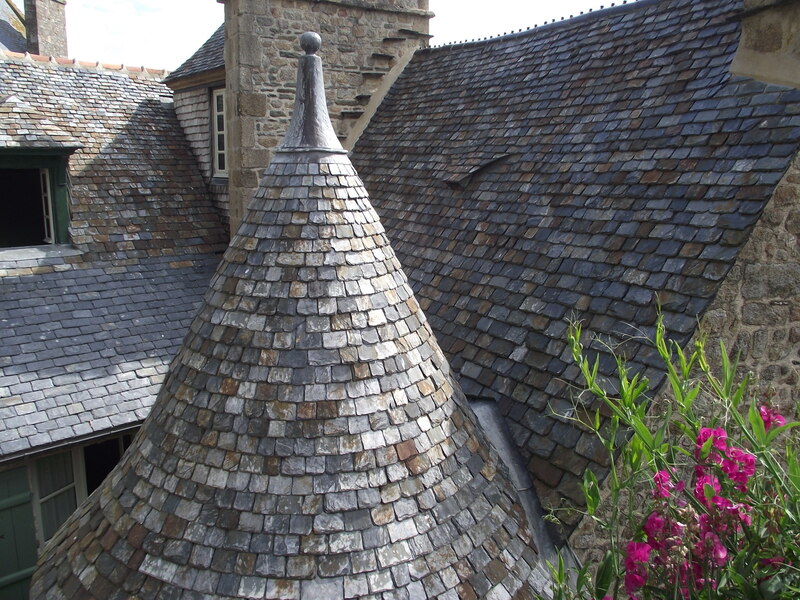 Diana, ah Mont Saint-Michel is indeed a magical place! My fondest memory perhaps was walking on the tidal flats just as the tide was beginning to come in. i will keep the memories of mont st. mitchell forever i was in awe the moment i saw it from afar and was stunned when the mont was in front of me. i will dedinitely come back. I agree completely, seeing it even from afar is like seeing a completely magical place, and the excitement and awe only grows as you come nearer to it. It’s no wonder that the ultimate fairy-tale factory, Disney, used it for its visuals, it’s indeed a spectacular place.